Today, we tackle a sensitive subject, often relegated to the background by the newlyweds but still essential. This is, in fact, the first thing you will need to fix after determining the number of guests present at your small (or large) party. Yes, we are talking about the budget of your wedding. Getting married should not make you forget about any logistical consideration. If you do not set a budget before starting your research for providers, you will soon find yourself with a wedding that is worth a king’s ransom. So, as we know that you will be the most organized of brides, take the time to establish a realistic budget with your dear and your family. That is the best way to avoid any bad surprises. We have therefore brought our calculators to give you an estimate of the prices involved for the different positions of a wedding. It is up to you to then make your calculations to adapt the rates to your own case. 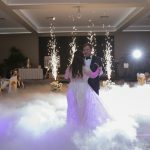 Choosing your wedding venue is an important step in organizing your marriage because it will allow you to set the scene for your day. The rental price will vary depending on whether you choose a large and central venue or a more intimate place. But roughly, a nice place of reception will cost you around $14,785. However, depending on the region, the popularity of the place or the services included, this price can very quickly climb (up to $32,000 for the entire weekend). The food is probably one of the most important parts of a wedding. Indeed, feeding your hungry guests has a cost… Do not minimize this expense because we all know that your guests will be satisfied with their day if they enjoyed the meal. The fact is that most wedding venues will require you to use their own caterer, charging around $100 per head. Adding an open bar or any other alcohol package will raise the bill as well. 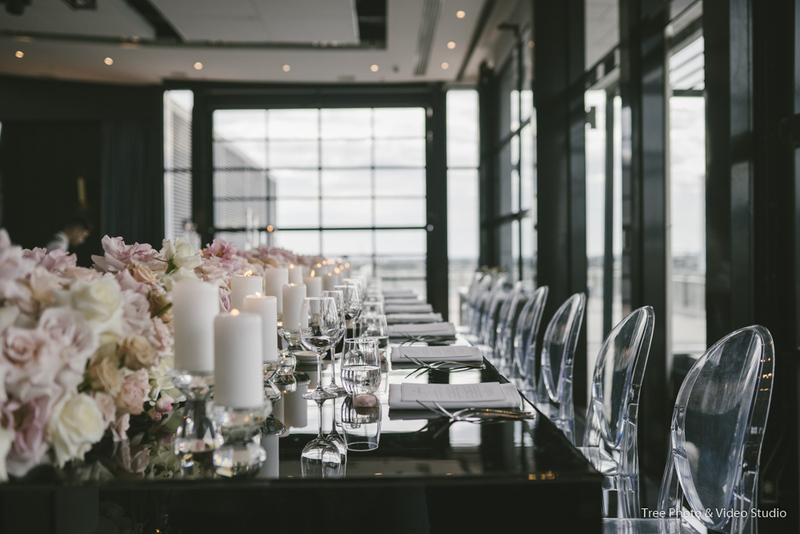 In most cases, you can expect the costs of venue, food and alcohol to eat up about half of your budget. Expect to spend about $ 18,683. 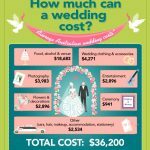 Australians spend on average $4,271 on wedding clothes and accessories. It’s worth knowing that you won’t have to spend a fortune to find a dress you’ll fall in love with. Retail options are increasingly popular, not only because they are affordable, but also because the offer is so dense that you can keep looking until the perfect piece catches your eyes. Aaaah wedding photography and video, those in front of which you dream, those that will be the memory of your day. To not be disappointed, it is more reasonable to turn to a professional who knows his job. One avoids choosing the uncle John who is used to immortalize family celebrations or that old friend who discovered himself a passion for photography less than three months ago. Count around $ 3,983 for quality photos, even if the prices change depending on the time of presence (all day, or only until the end of the cocktail). 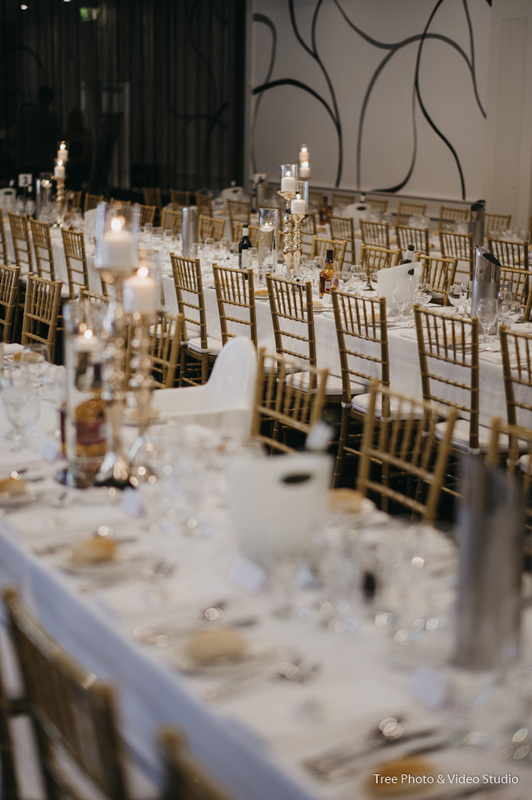 For Melbourne Brides-to-be, you could visit our website and check our packages as your reference. 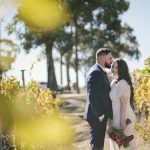 Unlike some other wedding photographers, we don’t hide the cost until you ask. The floral decoration will take a central place on the day because they will represent 70% of your decorations. So choose them carefully. This budget will vary depending on your choice: if you use a florist or if you buy your own flowers if you opt for seasonal flowers or not. In short, you can expect to spend around $3,000 if you want real floral arrangements for both your ceremony and reception. Sharing a similar budget with flowers and decorations (around $2,896), wedding entertainment is also an expense you have to keep in mind. A live band definitely adds something to the festivities. 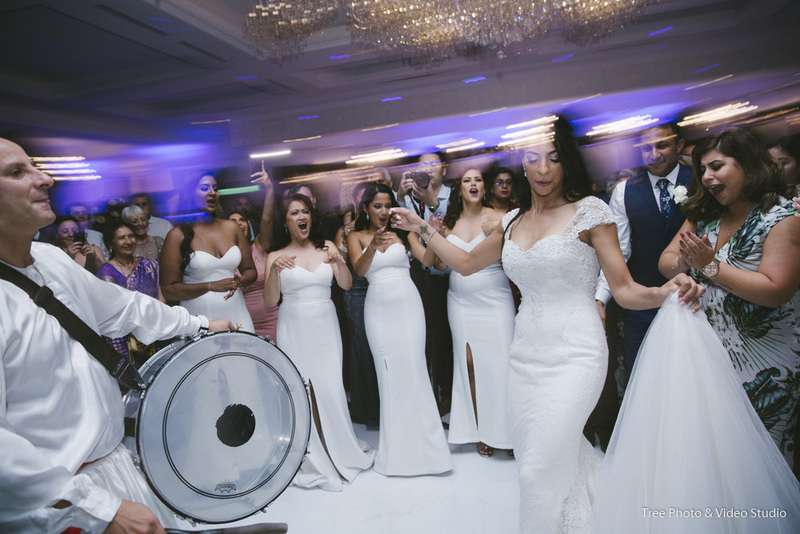 These days it’s increasingly popular for weddings to hire a professional DJ, or even bring their own playlist and simply plug it into the venue’s sound system. 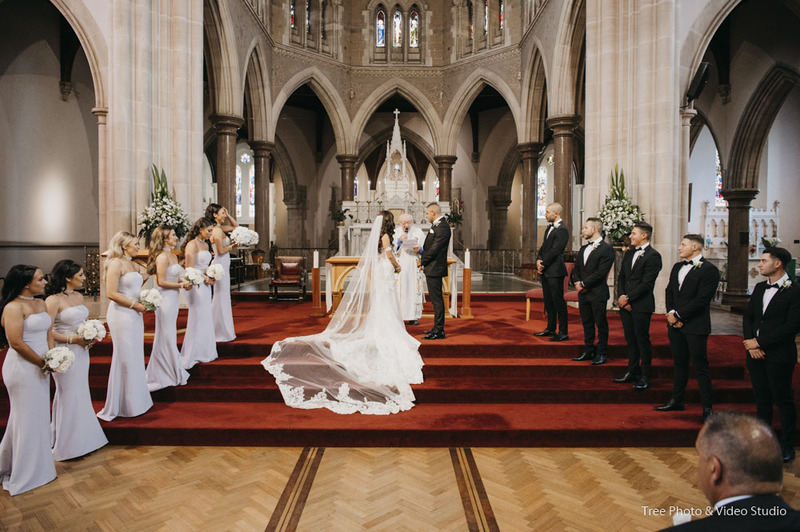 On average, the ceremony costs around $941, and miscellaneous expenses like cars, hair, accommodation and stationery runs to about $2,534. 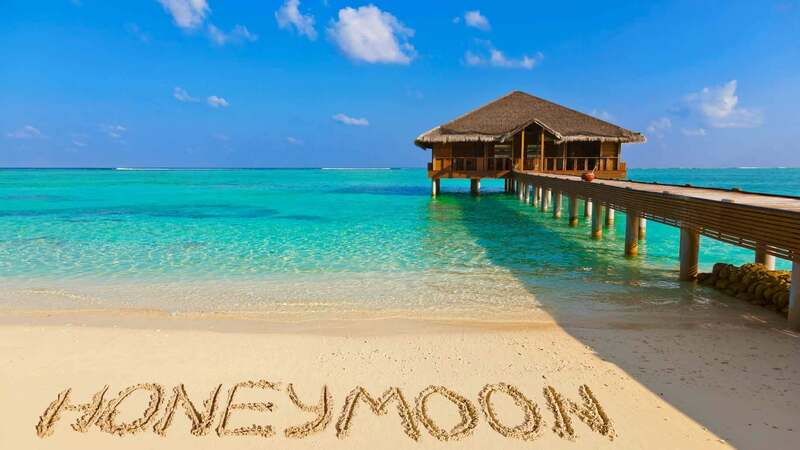 Choosing a honeymoon destination is about balancing what you want with what you can afford. To narrow down your options, websites such as TripAdvisor are handy for reading first-hand reviews of hotels and activities. Talking to travel agents can also help you find the cheapest time to head off. 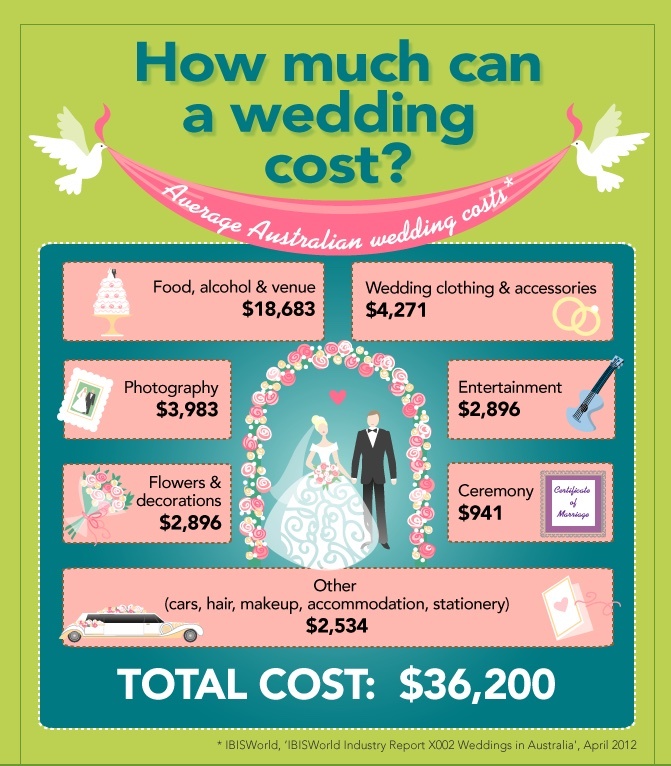 The total cost of an Australian wedding is on average, at around $36,200. Also remember that in 80% of cases, a wedding budget is exceeded. Just put some money aside, in case. If you felt like you were pushing a little deeper into your couch with each additional line travelled, do not panic. We will not hide it, a wedding is a consequent expense. Hence the importance of getting organised and planning well enough. But you will not have to pay for everything at once. For the most part, your expenses will be spread over the year(s) of preparations. And above all, think of all the positives. So, stick to your budget and everything will go for the best.